What a colorful omelet. Needs bacon and ketchup, though. @Marrock: My mom remembers this from back in the day. She was smart then, questioning why they had to colour random chicks. This illegal in most states, but it doesn’t actually hurt the chicks. The color will be gone as the lose their down and grow in feathers. I remember these from the 60s. 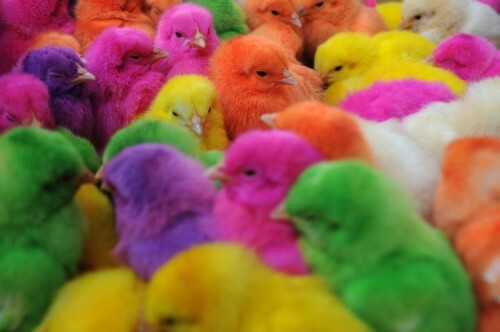 The dye may not have hurt them, but the vast majority of chicks died from neglect soon after the shallow novelty wore off. On the other hand, my cats would’ve liked them!